Horse Training At Its Finest. 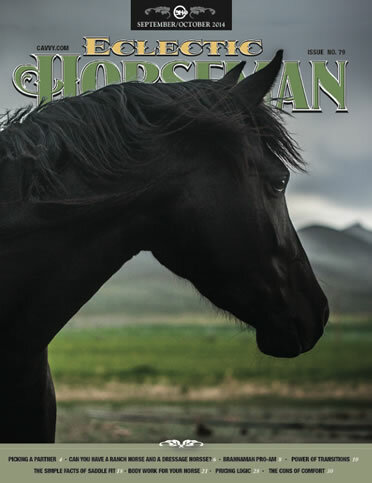 The Eclectic Horseman Magazine. 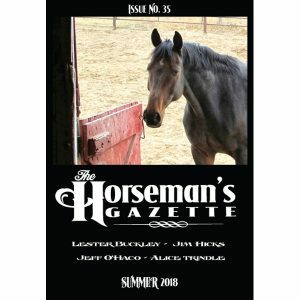 Home What is Eclectic Horseman Magazine? 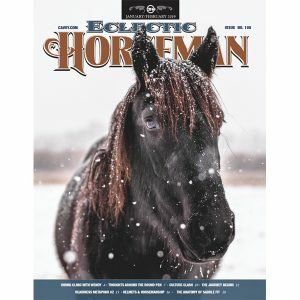 What is Eclectic Horseman Magazine? We are not just western — we are Eclectic! Providing quality information to inspire you to take ownership of your horsemanship. In the pages of Eclectic Horseman you will find some fundamental tenets of horsemanship that apply to all horses and riders. All horses need to be gentle. They need to be able to encounter new environments and situations in a relaxed manner. They must be able to move in any direction at any speed in a way that is calm and controllable. They must be comfortable with their tack and what is being asked of them; they must not be troubled either by pain or lack of understanding. They must feel respected as the thinking, feeling, decision-making creature that they are. All humans need to feel safe and relaxed when they are handling or riding their horses. They need to understand how their body moves and how their horse’s body moves so that they can be effective and reasonable when they ride. They need to know how to care for their horses so that they stay fit and healthy for many years. Helping horse owners to understand when and how to use what tack, and to become knowledgeable in selecting quality equipment, will lead to safety for both horse and rider. Currently there is no mainstream media voice for the horse. The horse is a thinking, feeling, decision-making animal, and yet he is at the mercy of the human for all of his life. No one acts in a way that they know is wrong just to be wrong. Inappropriate or harmful behavior is committed by humans to horses because they do not know another way. If they knew a harmonious way to achieve their goals with their horses, they would follow that way. By presenting this deeper nature of the horse, Eclectic Horseman can change the way that people think about their horses and, more importantly, change the way they interact with them. In Eclectic Horseman we present information from well-known clinicians and trainers including Buck Brannaman, Martin Black, Joe Wolter, Wendy Murdoch and Bryan Neubert. We also feature lesser-known clinicians, trainers and cowboys who get up and work with horses and students every day. Since the lesser-known clinicians, trainers and cowboys are not in the show ring, many readers may have never heard of them. Getting information from then can be more of a challenge, since they are not used to giving interviews or doing photo shoots. Yet these horse professionals have their finger on the pulse of what their students need and offer priceless insight to students to effectively help their horses. Also, the ideas and methods developed by horsemen and and -women over the centuries will be researched and brought to Eclectic Horseman readers. Here’s an idea of the kinds of articles and features you can expect to see in every issue of Eclectic Horseman Magazine. Detailed step-by-step articles teaching readers how to perform specific tasks or accomplish certain goals with their horse. Articles covering a variety of levels, from beginners to more advanced riders. Anecdotes from talented horsemen that teach a horsemanship lesson or experience. Explanation of why horses have certain reactions and why some methods are more effective. Stories that teach how to build a better relationship through understanding and communication. Readers’ questions answered by a horseman who offers advice and solutions to their problems. Clinic and event listings for horsemanship activities around the country and worldwide. Opinion polls and letters to the editor giving readers a chance to express themselves in print. Exploring how craftsmen create the equipment we use on our horses and ourselves. Looking outside traditional understandings: biomechanics, body movement, holistic medicines. Studies and reprints of ancient horsemanship texts to learn from the masters of the past. Limited and never the driving force behind our business model. Services and products we feel would be of interest to our customers. Persons whose methods and teachings are congruent with EHC’s.